In Donny’s lab in the sewer lair, Mikey finishes equipping a high-tech, hermetically sealed “enviro suit”. Donny finishes uploading the last of the security codes and then wishes Mikey the best of luck on his dangerous mission. With can of Comet and scrub brush in hand, Mikey engages the enemy: A toilet that looks like it has not been cleaned in years. *Personally, I like to place this story near the end of the “Early Years” era of my Mirage timeline, but it could really fit just about anywhere. I think it was actually Tristan Jones’ idea to place “The Mission” near the end of the “Early Years” era of the Mirage timeline back when he gave it a once over for me during development. 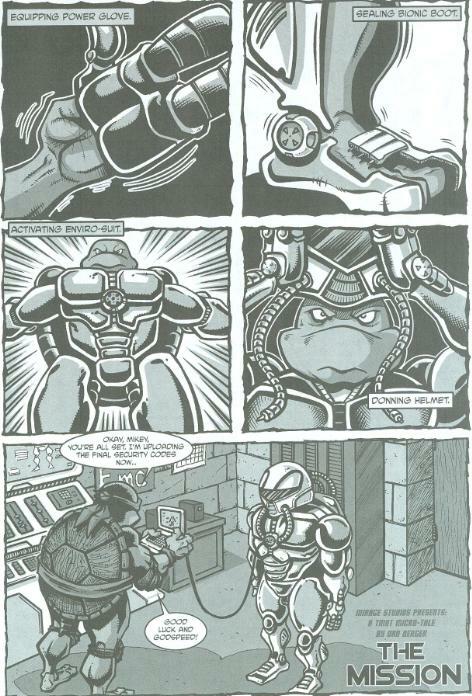 I recall being hesitant about placing it there at the time because I wasn’t sure I agreed with Donny having such advanced equipment at such a young age, but I kinda came to dig the idea when seeing it placed after “Junk Man”. In that story, Donny encounters a sentient robot alien and, after coming to terms with one another, the alien helps Donny take a bunch of military techno junk back to the lair. It almost fits as a follow-up, seeing Donny use what he’d learned from the alien and what he’d acquired from the military scrap to create a suit of armor for the mundane task of cleaning a nasty toilet. Of course, that is strictly my conclusion. You can place this thing wherever you want. Anyhow, it’s just a two-pager by Dan Berger ending on a splash page of a toilet. It’s cute and all, but, you know. Not really something to discuss.